I’ve updated this for clarity. I heard a small group tell how they spent time in discernment on climate policy, in order to work with others. Their discernment, in the manner of Friends, involved meditation, prayer, and seasoning ideas with others present, as well as reference to popular media sources. It did not include reference to peer-reviewed scientific literature, which might have brought them up against ideas they would find difficult to accept without giving up long-held beliefs. The group’s use of the word discernment confused me, because despite the care taken to engage in discernment, God apparently took the group and plopped them down with none of their preconceptions changed; their choice of solutions remained remarkably similar to what they went in with. Climate policy is of momentous importance to each of us, and to the world. We are challenged both in how we live, and in our ideas as to which policies work. We are challenged because we lack not only an easy path, but perhaps any path to keeping atmospheric concentrations of greenhouse gas low. We certainly lack easy hope. Those of us who work on climate change usually manage to find some hope, but we do not see a world in 2050 as biologically spectacular as today’s, nor as nurturing to humans and other species. Given the intellectual, emotional and spiritual challenges, it’s hard to imagine that all the ideas on climate change we bring could survive unchanged after serious discernment. My experience of discernment is different. The effects of true discernment can be much like what happens in the movie Wizard of Oz. Dorothy is living her life when a tornado sweeps her to a country of never-imagined dangers, of beauty and vivid colors and new friends. She returns home, but is forever changed. Similarly, I heard someone describe the changes effected in him when he stopped using cars and airplanes for political reasons. He began to lose his sense of entitlement, as he lost his ability to go wherever whenever he wanted. Paradoxically, he now finds life more joyful, not more deprived. I went through the same experience. When I considered whether to replace my car when it broke in 1991, the environment was on the list of what I thought about, but much higher were cost and my need for more exercise. It was only in the mid-90s, when I began to read about climate change, that environment began to feel like an important reason to me. The sense of entitlement represented a challenge I was not even aware of until later, even more so after I stopped flying as well. Inadvertently, I found I had moved into a less entitled lifestyle. For both of us, the benefits to giving up driving and flying were more than we expected. We changed our lives for external reasons, but found internal reasons to be glad. In 1995, together with a number of Friends, I began conscious discernment on energy policy, in particular the contest between coal and nuclear as energy sources. Following up on a puzzling discovery made in a writing class, I found myself on a totally different path from where I had always been. I counted myself less tolerant of fossil fuel use than other Friends at the time, in part because I had given up driving, and with it decreased my dependence on oil. And as someone who grew up poor, I identified with the toll taken by coal-mining accidents. On the other hand, I also initially reflected the common doubts about nuclear power, and thought it was probably about as dangerous as coal. It took two months or more to turn my beliefs around, let myself be tossed up and land in a different place. By the time I was done with this process, I had come to the realization that nuclear power was not as destructive to human health and the environment as coal, not even a “necessary evil”, but actually a benign, even attractive, energy source that could help decrease our use of far more damaging fossil fuels. It became clear to me that I had not understood what is true, what is important, what is mine to do. There was a tornado—I had discovered that I and most of the people around me were terribly wrong in our received ideas about the relative dangers of nuclear energy and fossil fuels. In the process, I became aware that pro-nuclear scientists were much more worried about climate change than any of the dangers usually cited for coal. These realizations dropped me into a new world—a beautiful planet and its peoples suddenly more fragile and endangered than I had imagined. There was much to learn about climate change, and there was also God’s hand pushing me onto another path, guiding. This description overstates the clarity of the way forward, but it was quite clear that I should not be doing what I had been doing, and should begin working with Friends on energy issues. The Call was unmistakable, my dedication unwavering, but my path was not immediately apparent. At the time I was dealing with loss of hearing and communication challenges greater than I had ever known. I had to become a different kind of teacher from my years in the classroom, which meant I would have to become an ever more conscientious student. And I was not alone in needing to know more than seemed to be known about the best way forward. Many others were then, as now, baffled and frustrated by the challenges of getting people to respond to the dangers already overtaking us. My new calling resulted in a total reorientation of my life, its goals and purposes, and required whole new sets of skills and new knowledge. But I could no more have turned back than Dorothy could go home until her adventure had brought her the wisdom she needed. There were a few things I was going to have to learn, including how to meet fierce opposition and personal attacks, how to open the eyes of those afraid to see, and how to keep my own energy and hope as I listened to new reports of growing dangers. I often felt that I was trying to “get home,” that is get reconciled with my community of Friends by sharing my awareness. Instead, I found myself often in deep and dangerous forests with a tiny company of friends to help me meet the requirements of my task. More than once I cried out, “God, do I have to do this?” This period taught me that an essential part of discernment is solitary even when friends (and Friends) are present. One common image during the year+, beginning in 1995, was the burning bush of Moses. I kept pointing out the burning bush to others: “Climate change y’all!! Y’all, yoo-hoo, climate change!” I realized after a while that the burning bush Moses saw wasn’t in the desert, but on his equivalent of Market St., where so many walk by pretending not to see. Like Moses, some of us don’t have that option. I also shared Moses’ challenges in communication—I continued to lose hearing, and was a terrible writer. But I felt that I couldn’t just keep walking and ignoring climate change. 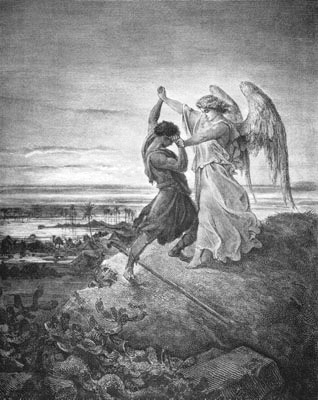 During that period, I also pondered the image of Jacob’s wrestling with the Angel, because I was wrestling with the Angel myself: what was I called to do? All Jacob got out of the night was a dislocated hip (in my case, the ego was seriously dislocated—I had not understood the issues, not understood which sources we can trust, had not even articulated the questions). But the process of wrestling with the angel changes one forever. Jacob’s name was changed to Israel to reflect the inner changes. Thomas Kelly in Holy Obedience describes the joy of self-renunciation and of sensitive listening as breathtaking. Yet another fruit is entrance into suffering. Discernment is not always such a profound act for me. Yet I am always changed, even if I decide to keep to the same path. I will have new reasons, new resolve, new clarity and focus, new energy and dedication because I am no longer divided in myself. I have tested my ideas and purposes against doubts and questions I allowed myself to hear and answer. When I am not changed, as I labor over a question, I am not confident discernment has taken place—perhaps I have just reinforced what I already I new or believed. One of the great dangers inherent in teaching and activism is an unconscious resistance to such change. I’d prefer to believe I have been right than to be right. Discernment works best when the goal, “to have been right,” is not primary. Now more than ever before, what the world needs are people willing to have been wrong along the way, many times over, people who are continually discerning what is true now, what is important now, and what is mine to do. This entry was posted on Wednesday, January 21st, 2009 at 2:32 pm and is filed under General. You can follow any responses to this entry through the RSS 2.0 feed. Both comments and pings are currently closed. The last paragraph says it all. How are environmentalists who love the Earth to become really discerning about how the love can be best expressed for the benefit of both humans and non-humans? How are new points of view and new hard evidence to be allowed by those who care about and love the Earth, as much as by those who are absorbed in a more anthropocentric existence? Your words hit the nail on the head. We are only JUST beginning to understand nature and it behooves all of us to adopt a more humble and less ardent position in relation to many issues concerning the human-Earth relationship. Thanks for a GREAT essay, Karen.